Blacksmith Buddy, a Farrier Training Device by Champagne Horseshoe Co.Blacksmith Buddy	Blacksmith Buddy, a Farrier Training Device by Champagne Horseshoe Co.
A horse at full gallop is one of the most majestic sights on Earth. By nature’s design, horse hooves absorb thousands of pounds of pressure with every footfall. The farrier (also known as a horseshoer, blacksmith or smithy) ensures the health of the horse by protecting its feet. An expertly crafted and fitted horseshoe will dramatically improve the health, happiness, locomotion and performance of a horse while better protecting the rider from spills. Learning this craft is no easy task. 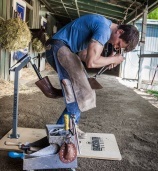 A farrier must practice on hundreds of hoofs to master the technique and build the upper body strength to do the job right. Yet one wrong placement of a nail can lame a horse in an instant. That’s a risk nobody wants to take -- and thankfully, nobody needs to ever again. -A product developed by world-renown farrier, Wes Champagne, it is revolutionary in its simplicity. -A training device which perfectly replicates the weight and angle of an adult horse leg. -The only product capable of creating an authentic shoeing experience -- without subjecting a live horse to the risk of injury -- without subjecting a person to train on a cadaver leg! Available to suit all types of farrier training, the Blacksmith Buddy Original and the Blacksmith Buddy Junior can assist farriers young and old. These farrier training tools are proven assets for beginners in the trade, or for older farriers in need of rehabilitation. Learn more today. We just finished a Vettec clinic with Larkin Greene and my students. We used the Blacksmith Buddy in the classroom for a variety of applications, missing wall, quarter crack, sole packing etc. AWESOME! ... I think that Wes has developed the most revolutionary teaching tool I have ever worked with in the 39 years I have been in this profession. Every time I get my hands on the Blacksmith Buddy, I'm impressed all over again....the only thing it doesn't have is hair and an attitude. We used the Blacksmith Buddy with a new class at Pacific Coast Horseshoeing School. What an amazing teaching tool! One on one with each student. Body position, proper use of the hoof knife, nippers and rasp all without worrying about the horse standing quietly for hours. Thanks Wes! !